I love how Fergus Henderson (The Whole Beast: Nose to Tail Eating) describes the “not quite meat not quite fat” quality of pork belly: “ It’s onomatopoeic ~ belly is like it sounds ~ reassuring, steadying, and splendid to cook due to its fatty nature. It’s not a cut to rush and with that a certain calm is imbued in the belly.” Of the diner, that’s for sure. The Pork Belly craze that swept the restaurant world the past few years gave rise to a lot of awkward pairings which either over~played the richness of the cut or tried to disguise it ~ chocolate covered pork belly anyone? The desire to press PB to reduce the fat isn’t always the answer either, as in doing so you loose the fluffy quality of one layer melting into the next. Why disguise the fatty attraction of the cut ? Just remember a little bit of belly goes a long way and enjoy. 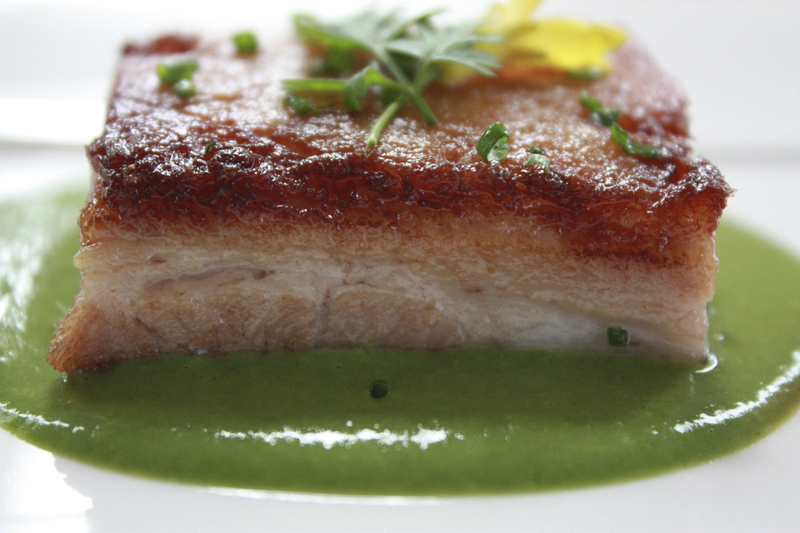 Pork belly makes the most delicious first course. Ryan’s take on it for dish of the week was to celebrate what we hope is around the corner ~ a glorious spring! He choose condiments with vibrant colors and bright flavors, but used them with discretion, paying homage to the full, rounded and soul satisfying essence of PB, especially for carnivores of the nose to tail variety. Kumquats, wonderfully bright and bitter, wake the taste buds up in a way that makes all flavors that come into contact with them all the more distinct. A citrus fruit the size and shape of an olive, the oval kind we serve raw this time of year has an edible sweet rind. Pairing thinly sliced kumquat with the pickled crunch of tagliatelle of red onion and a smooth peppery green arugula purée was a brilliant way to isolate the richness of the belly while allowing its flavor profile, with hint of maple syrup in the finish, to sing. Tommy paired the Pork Belly with a 2006 Kerpen Riesling from Wehlener Sonnenuhr,“the Sundial of Wehlener,” Sonnenuhr meaning sundial, Wehlener being the town where the grapes are grown. The vineyard is so named because in 1846 the first man to plant grapes in this part of the Mosel Valley, Jodocus Prüm, painted a giant sundial on the face of the highest cliff of this rocky outcrop, perhaps to celebrate the sheer insanity of trying to grow anything where there was no topsoil and only shards of pure blue slate. His folly was our gain ~ and 200 years on Riesling from this area is one of the finest expressions of terrior in winedom. 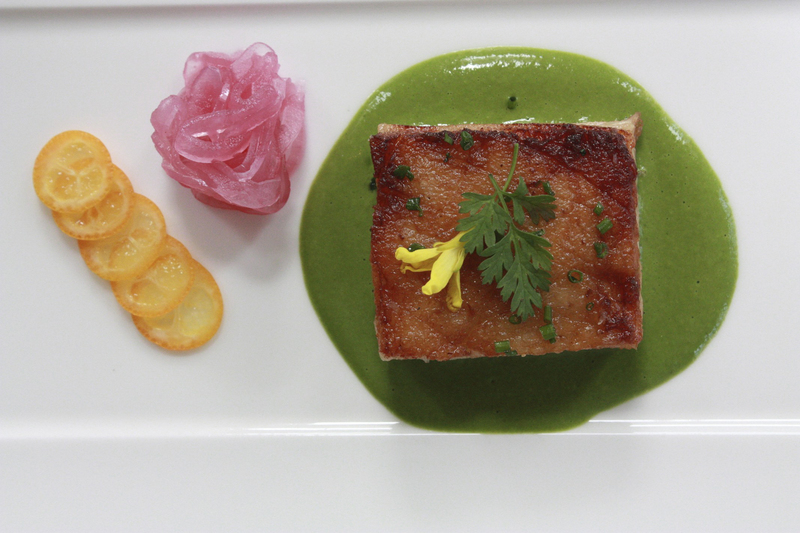 Like fois gras, Tommy believes Pork Belly calls for a wine with sweetness and viscosity, and a good bit of acidity to cut through that richness ~ the same reasoning behind Chef’s choice of pickled onion and raw kumquat. He is especially partial to Rieslings from this part of Germany when they are properly aged, as only then do they begin to develop the interesting aromas that make this varietal especially enticing. It’s called having a petrol nose, what the French call goût de pétrole. Petrol, kerosene and rubber are all aromatic attributes that are highly sought after in a mature Riesling.